Today is the 4th of July for the USA, but it’s also Caesar Salad day! I was a fussy kid and the only salad I would eat was Caesar Salad. It’s typically made with romaine lettuce, croutons, Parmesan cheese. lemon juice, olive oil, an egg, Worcestershire sauce, pepper and black garlic. However, I’ve seen it served many ways by adding some grilled chicken or a creamy dressing and even lobster. This recipe for Warm Caesar Potato Salad is more Caesar salad than potato salad in my opinion. 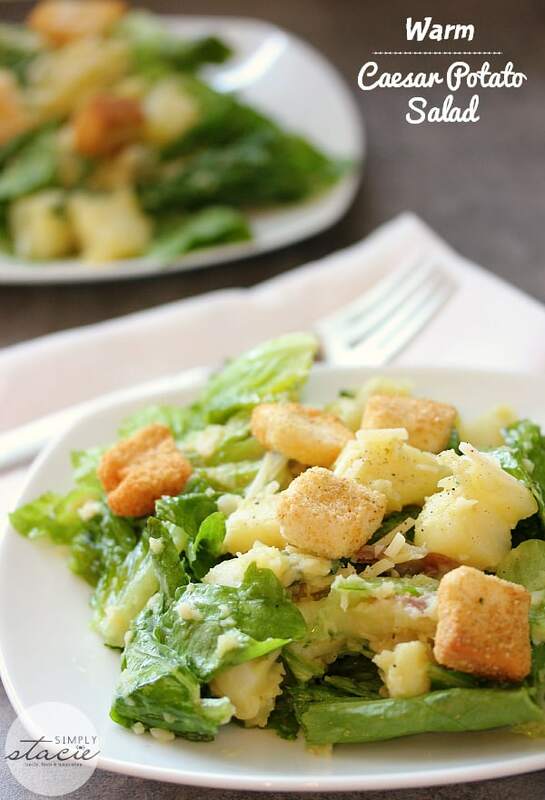 It has many of the traditional Caesar salad ingredients, but also adds some cooked potatoes. The potatoes are cooked in the dressing on the stovetop so the fresh garlic flavour can permeate. It is SO GOOD! I often having cravings for this salad. Serve it with some barbecued steak and you have a delicious meal. You might also enjoy this BLT Salad. This Warm Caesar Potato Salad goes perfectly with a grilled steak. A perfect summer meal! Boil potatoes in salted water until just tender, about 20 minutes. Drain and let cool slightly. Cut into cubes. Set aside. Tear lettuce into bite sized pieces and put in a large bowl. Set aside. In a large skillet, heat olive oil over medium heat and cook the garlic for 2 minutes. Stir in lemon juice, parsley, Worcestershire sauce, mustard and salt and pepper. Add in potatoes and cook over medium heat for 2 minutes, stirring constantly. Pour potato mixture into bowl with lettuce and toss. Sprinkle with Parmesan cheese and toss. Add croutons to individual salad plates, if desired. Wow, this is different! I am kind of intrigued to try this! I wonder what my gramma would think, I have to share this with her! This sounds so delicious and I like that it is a nice warm Caesar Potato Salad. I need to make this salad and have it this Summer! Now this is a salad! I’ve never heard of the combo before, but I can imagine how tasty it is! Thanks for the recipe! and yet another awesome recipe, I’m going to have to give this one a try, first time I heard of this, never imagined using potatoes…interesting and different!! Sounds interesting, would of never thought of adding potatoes but I am sure they would work good in it. Thanks for the recipe will have to try it out! I’m not the biggest fan of Caesar salad, but I’d give this a go. Looks tasty! We all like baked potato and salad, but I had never thought about putting them together. I certainly wouldn’t have on a Caesar salad. Very interesting and different. I bet the warm potatoes would be good with the dressing. I love caesar salad but never thought to put potato in it. Will have to try this! This is a new recipe for me – think I’d like it! Two of my favorite salads in one, great! This is so unique, and I love the ingredients in the dressing. However, as my hubby is on a low-carb diet right now I’ll have to pass on the potato. But this will be great with tomorrow nights grilled octopus. A MUST try! I like potato and caesar salads so this seems like a no-brainer! This looks great; can’t wait to try it! I have to be honest I am not a fan of the caesar salad, I never order it when eating out. This warm caesar salad looks delicious, definitely something I would eat. Thank you for sharing this recipe. Oh I’m loving these summer salad recipes!! Thank you .. Caesar is one of favourites. Oh YUM! I like caesar salad and the flavors would go well with potatoes. Thanks for the recipe. I don’t usually like potato salad but this one looks really good. I love caesar salad! This looks delicious! I’ve had warm German style potato salad before, but not Caesar! I’ve got to make it! This salad looks yummy. I love caesar and potato salads! Would love to make this salad sometime!! I will try it this summer. This sounds so good thank you for sharing. This looks so yummy! I love German potato salad, which is usually warm. I can’t wait to make it! I have never tried a warm Caesar salad. This sounds yummy! This is so unique to me.I’ve never seen a recipe like this with potatoes in it but it sounds very delicious and it’s a definite must try for my family to enjoy.Thanks for sharing it with us. OMG this sounds so good. Thank you for sharing this recipe with us. I never thought about potatos and fried too! This sounds great and will have to try it. Thanks for sharing. This looks like it would be a hit with the Caesar Salad lovers in our family. Thanks! This sounds delish!!! Made your broccoli casserole and it was so tasty! I love this idea. Potatoes are good, Caesar salad is good, put them together = great, right? Can’t wait to try it…love warm potato salads. Caesar Salad is a favourite of our family. Like the idea of potatoes in your recipe and because it is warm. Plan to introduce your recipe to my husband today. Thanks for sharing.